Now the spring/summer weather is on its way (fingers crossed) you might be thinking of days out for you and the person you care for across Derbyshire. Did you know that some tourist sites in and around Derbyshire that advertise a “carer’s go free deal”? Guests who have the following documentation are entitled to one free carer ticket and a second carer at half price. However, the guest with the disability and any other members of their party will pay full price. Letter from GP or consultant (dated within the last 12 months) confirming the need for a full time carer. This does not need to be a letter of diagnosis. You can find out more by reading their resort access guide. Discounted price for special needs adults and carers - see their admission prices. The museum offers free admission for carers and a discounted rate for less able visitors - see their accessibility information. The Essential Companion card makes it simple to bring one or two carers or companions with you, free of charge. Just show the card when you arrive, and your carer(s) or companion(s) won’t need to pay an entry fee. It’s in your name so you can bring whomever you like, but even if you don’t have an Essential Companion card, you can still bring carers or companions free – the card just makes it quicker and simpler for you. Find out more here. This is a list of all the National Trust places to visit in the Midlands. If the person you care for has to have you with them to be able to use a service (e.g. go to a visior attraction), then you they are covered by the Equality Act. This means that attractions should not charge you as the person's carer as they wouldn't be able to access it without your support. Don't be afraid to ask or challenge the staff if they refuse this, it may be that they just aren't aware. More info and advice about this is on the Carers Trust website. There are a lot more places to visit across Derbyshire for you to visit but in all cases it is best to contact them directly before you go to see if they are aware of the rules regards the Equality Act and free entry for carers - this will save any confusion when you arrive. If the person you look after is disabled or has an inpairment, they can get an Access Card. The card has symbols on it that relate to the person's needs and is accepted as proof of disability at venues across the country. The card can be used to quickly and discreetly let a service or company know about their needs and can help you access concessionary tickets prices and accessibility / adjustment support. It can also be used to help you get free entry as a carer by prooving the person you care for has a disability. Because this is the UK and spring / summer doesn't always (or even often) mean good weather, it's sometimes necessary to find things to do indoors! A CEA card enables a disabled cinema guest to receive a complimentary ticket for someone to go with them for free entry when they visit a participating cinema. Calling all football fans, did you know that a lot of the football clubs in Derbyshire offer free entry to games for carers? Derby County Football Club - Offer a free of charge ticket for a carer to attend a game with a disabled supporter. To apply for a personal assistant / essential companion ticket there is a form to complete that will be sent to Derby County Football Club's Disabled Liaison Officer to check eligibility. Chesterfield Football Club - Offer a free of charge ticket for carers who provide evidence from the Department of Works and Pensions showing the Disability Living Allowance is in the middle or higher band of care. Disabled tickets can only be purchased in person from the ticket office providing the above evidence of eligibility. Alfreton Town Football Club - Offer a free of charge ticket for carers of disabled supporters. The club requires proof including a letter stating receipt of the Disability Living Allowance or a personal letter from a GP to gain the carers go free ticket. Sheffield United Football Club - Offer a free of charge ticket for carers. You are eligible for a free ticket if the person you care for receives Personal Independence Payment or Disability Living Allowance at the middle or higher rate care component will automatically qualify. Getting out and meeting other carers, making new friends or even just having a cup of tea with someone new. We have a searchable directory of all the groups and social activities across Derbyshire. There are accessible walks taking place across Derbyshire this summer. The walks are fully accessible to wheelchair users and the pace and length of the walks is modified to suit the group taking part. To find out what's happening in your area, visit the Active Derbyshire website - they'll be able to put you in touch with the walk organisers. As the lead provider of carers services in Derbyshire, Derbyshire Carers Association often arrange events for carers including walks, training sessions and groups. Visit their website or give them a ring to find out more on tel: 01773 833833. If the person you care for has a physical disability they might struggle to use standard toilets as there just isn’t enough room to move around. 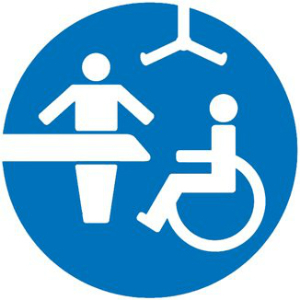 Changing places are adapted toilets with more space and specialised equipment including a height-adjusting changing bench and hoists. Derbyshire County Council have a list of the Changing Places across Derbyshire so you can check out where the closest changing place is. Accessible Derbyshire have information on their website too. Are you worried about the person you care for getting lost, scared or in need of help when they are out and about on their own? Safe places are public buildings in towns and communities that have the safe place sticker in their window. The staff inside will help the person by getting in touch with an emergency contact to help them get back home safely. You can apply for a keep safe card for the person you care for and on the card you can write details such as emergency contact, communication needs and other important numbers or information. If they need help when they are out and about they can just go to a place with the Safe Place sticker and give the card to a member of staff who will be able to help. The Accessible Derbyshire website has details of loads of places you can visit that are accessible to people with disabilities. You can follow them on Facebook to keep up with news about any events or activities. One of the biggest barriers to getting out and about is actually getting where you want to go. Derbyshire Connect provides transport to shopping destinations for people unable to use conventional buses because of age, disability or because they live in areas where public transport is limited. Find out more here. 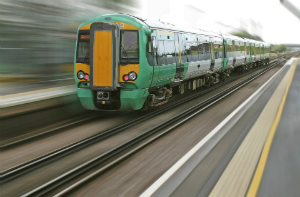 If you are looking to maybe go further afield, the National Rail website has information about the accessibility for train stations across England. The Blue Badge scheme helps you park closer to your destination for people with severe walking difficulties, who either travel as drivers or passengers. The vehicle must be registered in the disabled person’s name or their nominated driver’s name. 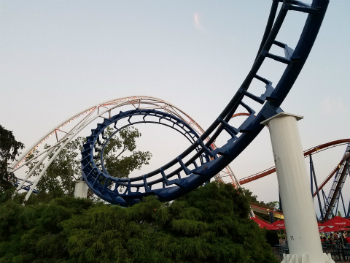 It must only be used for the disabled person’s personal needs. It can’t be used by the nominated driver for their own personal use. If you know of any more local places, schemes or events to help carers and the people they look after get out and about please let us know so we can share them with other carers.